In the near future, disease will be a condition of the past, cured genetically at birth or soon afterward. But for the generation born before this development, it is too late, and they must get along as best they can. Lou Arrendale is in this lost generation. He is a high-functioning autistic with a job, friends and a love of fencing. But now, an experimental treatment will cure his autism. The question is, will he be the same person after he receives the treatment? This is the first time I’ve been really happy that a book was on tape as opposed to CD. Normally I like not having to change cassettes or flip them over, but The Speed of Dark hooked me so deeply that I took it everywhere with me. I dragged my little portable tape player around the house and then would pop the tape out and put it in the car stereo while I was running errands. I couldn’t stop listening. Most of the novel is told from Lou Arrendale’s first person point of view and Grover Gardner gave a pitch-perfect performance. His clipped and precise delivery captured the precision with which Lou dealt with the world. Coupled with Ms. Moon’s evocative language, the story unfolded with the inevitable beauty of a Bach cantata–events surprised me, but there was no other way for the story to unfold. One of the most fascinating things was how Ms. Moon dealt with Lou’s perceptions of normal people. He had been taught that it was rude to interrupt other people, but normal people could interrupt and it was not rude. He is fascinated by how normal people can pick up on subtle social cues so that they seem to read each others minds. His wonder at the complex pattern of group conversation is so palpable that I felt it too, and found myself watching a conversation of my friends with some of the same awe. How do we know when it’s time to stop talking and let someone else, or when it is okay to interrupt and when it is not? Other sections of the book are briefly told from the point of view of other characters, but Ms. Moon stays with third person for them. The writing is as clear, but I never connected with the other characters and sometimes found myself shifting in my seat, anxious to get back to Lou. These sections provide necessary plot information, and are also a fine way to view Lou from the outside. I suspect that in written format, my impatience would be less pronounced, but since Lou’s sections are in first person I came to associate Mr. Gardner’s voice with Lou. When he was reading other characters it seemed like a mask. A good mask, but I wanted Lou back. And that is the crux of the novel. Ms. Moon made me care about Lou by showing me the inside of his thoughts. I could not fathom how he could possibly be the same person if he were not autistic. The dilemma is fascinating. I won’t tell you what decision Lou makes in the end. Why? 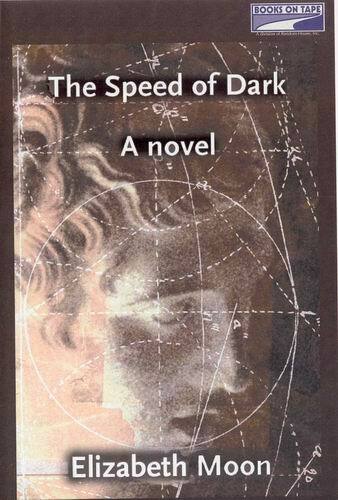 The gift-giving season is upon us; rather than recommending this as an item for your gift-giving list, you should have a copy of The Speed of Dark for yourself.